Kim JY, Ahn MH, Jun HS, Jung JW, Ryu JS, Min DY. Toxoplasma gondii Inhibits Apoptosis in Infected Cells by Caspase Inactivation and NF-kappaB Activation. Yonsei Med J. 2006 Dec 31;47(6):862-9. Quinoline derivative MC1626, a putative GCN5 histone acetyltransferase (HAT) inhibitor, exhibits HAT-independent activity against Toxoplasma gondii. Smith AT, Livingston MR, Mai A, Filetici P, Queener SF, Sullivan WJ Jr.
Department of Pharmacology & Toxicology, Indiana University School of Medicine, Indianapolis, Indiana, Istituto Pasteur-Fondazione Cenci Bolognetti, Dipartmento di Studi Farmaceutici, Universita degli Studi di Roma "La Sapienza", P.le A. Moro 5, I-00185 Roma, Italy, Istituto di Biologia e Patologia Molecolari CNR, Dip. Genetica e Biologia Molecolare, Universita degli Studi di Roma "La Sapienza", P.le A. Moro 5, I-00185 Roma, Italy. We report that quinoline derivative MC1626, first described as an inhibitor of the histone acetyltransferase (HAT) GCN5, is active against the protozoan parasite Toxoplasma gondii in vitro. However, MC1626 does not inhibit Toxoplasma GCN5 HATs, nor reduce HAT-mediated activity; rather, this quinoline may target the plastid organelle called the apicoplast. Attend the General ASM Meeting in May 2007! This is a message from Kasturi Haldar, 2007 Chair, Division AA (Free living and Parasitic Protists) American Society of Microbiology. Please consider joining ASM and attending the annual ASM General Meeting in Toronto May 21-25, 2007. The more presence we have in national organizations that are a little broader than our own areas, the more potential we will have for influencing others to support our field. This year’s meeting has a significant increase in the number of sessions devoted to eukaryotic pathogens such that every day will have symposia of broad interest to parasitologists and mycologists.. There at least another 4-5 symposia of interest to parasitologists in the realm of pathogen-host interactions. ASM sessions run from Tue-Thursday and Friday morning and I expect that T-Thu will have at least two sessions a day and Friday will have one session (since the meeting closes at noon that day) of broad interest to parasitologists. General Summary. Division AA has grown considerably in 2006. As of today we have grown to 199 primary and 288 primary and secondary members. We are well on our way to a goal of 300+, primary and secondary by May 2007. This is important because membership numbers are critical in developing the program at ASM and are one important criterion used to allow us to organize increased numbers of symposia. Continuation and further increases depend on sustaining primary +secondary membership at 300+ and increasing attendance at the General meeting in Toronto. This meeting provides an excellent opportunity for trainees with broad interest in microbiology. ASM is an outstanding general microbiology meeting and particularly good for trainees who have broad interests to submit abstracts (see categories below). It is also relatively inexpensive meeting for student and post doctoral trainees. Funds are available to provide partial support (minimum of $300 per person) for as many as 30 trainees who submit abstracts and present posters at the meeting (BWF has expressed interest in supporting this). NOTE: TO OBTAIN SUPPORT YOU HAVE TO INDICATE THAT YOUR ABSTRACT IS SUBMITTED TO DIVISION AA. We will organize an informal dinner on Monday primarily as a venue to interact and to socialize as a group. This dinner will be especially useful for a trainee who might attend ASM without their PI because it will include pointers on navigating the meeting. If you have a trainee or are a trainee and interested in attending this event, please let me know. Toxoplasma gondii, an obligate intracellular parasite of the phylum Apicomplexa, can cause severe disease in humans with an immature or suppressed immune system. The outcome of Toxoplasma infection is highly dependent on the strain type, as are many of its in vitro growth properties1. Here we use genetic crosses between type II and III lines to show that strain-specific differences in the modulation of host cell transcription are mediated by a putative protein kinase, ROP16. Upon invasion by the parasite, this polymorphic protein is released from the apical organelles known as rhoptries and injected into the host cell, where it ultimately affects the activation of signal transducer and activator of transcription (STAT) signalling pathways and consequent downstream effects on a key host cytokine, interleukin (IL)-12. Our findings provide a new mechanism for how an intracellular eukaryotic pathogen can interact with its host and reveal important differences in how different Toxoplasma lineages have evolved to exploit this interaction. Just in time for your holiday shopping. 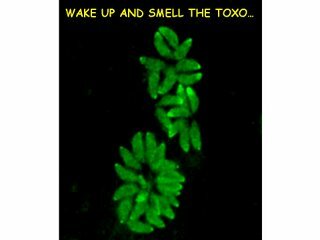 Buy yourself and those you really care about a Toxoplasma mug! The picture shows a nice immunofluorescence of Toxo tachyzoite vacuoles, or as my son calls them, "big green snowflakes." 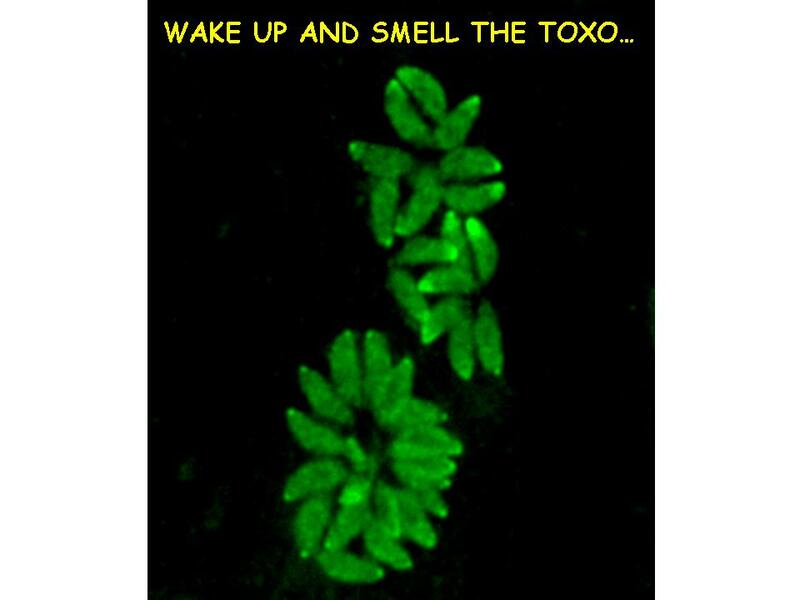 Text reads, "Wake up & smell the Toxo!" Cathepsin Cs are key for the intracellular survival of the protozoan parasite, Toxoplasma gondii. Que X, Engel JC, Ferguson D, Wunderlich A, Tomavo S, Reed SL. Pathology and Medicine, UCSD Medical School, San Diego, CA 92103-8416. Cysteine proteases play key roles in apicomplexan invasion, organellar biogenesis and intracellular survival. We have now characterized five genes encoding papain family cathepsins from Toxoplasma gondii, including three cathepsin Cs, one cathepsin B and one L. Unlike endopeptidases cathepsin B and L, T. gondii cathepsin Cs are exopeptidases and remove dipeptides from unblocked N-terminal substrates of proteins or peptides. TgCPC1 was the most highly expressed cathepsin mRNA in tachyzoites (by real-time PCR), but three cathepsins, TgCPC1, TgCPC2, and TgCPB, were undetectable in in vivo bradyzoites. The specific cathepsin C inhibitor, Gly-Phe-dimethylketone, selectively inhibited the TgCPCs activity, reducing parasite intracellular growth and proliferation. The targeted disruption of TgCPC1 does not affect the invasion and growth of tachyzoites, as TgCPC2 is then upregulated and may substitute for TgCPC1. TgCPC1 and TgCPC2 localize to constitutive secretory vesicles of tachyzoites, the dense granules. T. gondii cathepsin Cs are required for peptide degradation in the parasitophorous vacuole (PV), as the degradation of the marker protein, E. coli beta-lactamase, secreted into the PV of transgenic tachyzoites was completely inhibited by the cathepsin C inhibitor. Cathepsin C inhibitors also limited the in vivo infection of T. gondii in the chick embryo model of toxoplasmosis. Thus, cathepsin Cs are critical to T. gondii growth and differentiation, and their unique specificities could be exploited to develop novel chemotherapeutic agents. A patatin-like protein protects Toxoplasma gondii from degradation in activated macrophages. Mordue DG, Scott-Weathers CF, Tobin CM, Knoll LJ. Department of Medical Microbiology and Immunology, University of Wisconsin-Madison, 1300 University Avenue, Madison, WI 53706, USA. The apicomplexan parasite Toxoplasma gondii is able to suppress nitric oxide production in activated macrophages. A screen of over 6000 T. gondii insertional mutants identified two clones, which were consistently unable to suppress nitric oxide production from activated macrophages. One strain, called 89B7, grew at the same rate as wild-type parasites in naive macrophages, but unlike wild type, the mutant was degraded in activated macrophages. This degradation was marked by a reduction in the number of parasites within vacuoles over time, the loss of GRA4 and SAG1 protein staining by immunofluorescence assay, and the vesiculation and breakdown of the internal parasite ultrastructure by electron microscopy. The mutagenesis plasmid in the 89B7 clone disrupts the promoter of a 3.4 kb mRNA that encodes a predicted 68 kDa protein with a cleavable signal peptide and a patatin-like phospholipase domain. Genetic complementation with the genomic locus of this patatin-like protein restores the parasites ability to suppress nitric oxide and replicate in activated macrophages. A haemagglutinin-tagged version of this patatin-like protein shows punctate localization into atypical T. gondii structures within the parasite. This is the first study that defines a specific gene product that is needed for parasite survival in activated but not naive macrophages. Toxoplasma gondii infection lower anxiety as measured in the plus-maze and social interaction tests in rats A behavioral analysis. Gonzalez LE, Rojnik B, Urrea F, Urdaneta H, Petrosino P, Colasante C, Pino S, Hernandez L.
Los Andes University, Department of Physiology, Merida 5101-A, Venezuela; Genome Center, Columbia University, NY 10032, United States. It has been suggested that the parasite Toxoplasma gondii reduces the fear of rodents toward their feline predators, which may lead to an augmented rate of predation and multiplication of the parasite through an increased number of life cycles. To investigate whether T. gondii infection induces selective effects on behavior associated with anxiety, Wistar rats were inoculated i.p. with several doses of T. gondii tachyzoites and tested in two animal tests of anxiety. In the third week following inoculation, rats infected with 100 and 1000 tachyzoites increased plus-maze open arm exploration in a dose-related manner. However, no effect was detected in either social interaction levels or motor activity measures. In the seventh week after inoculation, rats infected with 100 and 1000 tachyzoites showed increased open arm exploration and social investigation without change on any motor activity measures. However, rats infected with a higher dose (1500 tachyzoites) showed a drop in locomotion. These data support the hypothesis that T. gondii impairs mechanism of warning as a function of reduced anxiety. The pattern of brain colonization by the parasite and the host immune response suggests that the predominant invasion to limbic areas works as a natural anxiolytic mechanism. Estran C, Brenier-Pinchart MP, Pelletier L, Cesbron-Delauw MF, Pelloux H.
Laboratoire Adaptation et Pathogenie des Microorganismes, UMR 5163 CNRS-UJF, Universite J. Fourier, Campus Sante, Grenoble, France. Interleukin (IL)-12, IL-10, and interferon (IFN)-gamma are major cytokines involved in the immune response against Toxoplasma gondii. Nevertheless, the role of IL-12 and IL-10 in the control of parasite replication and cytogenesis is not known yet, whereas the importance of IFN-gamma is documented. Furthermore, it is of paramount importance to study the interaction between T. gondii and cells from the central nervous system, e.g., astrocytes. In this study, we report that IL-12 and IL-10 have no effect on penetration, replication, or cystogenesis of the T. gondii Prugniaud strain in human astrocytes in vitro and do not antagonize the role of IFN-gamma on cystogenesis. Toxoplasma gondii Expresses Two Mitogen-Activated Protein Kinase Genes That Represent Distinct Protozoan Subfamilies. Lacey MR, Brumlik MJ, Yenni RE, Burow ME, Curiel TJ. Department of Mathematics, Tulane University, 6823 St. Charles Avenue, New Orleans, LA, 70118, USA. All eukaryotes express mitogen-activated protein kinases (MAPKs) that govern diverse cellular processes including proliferation, differentiation, and survival. Even though these proteins are highly conserved throughout nature, MAPKs from closely related species often possess distinct signature sequences, making them well suited as drug discovery targets. Based on the central amino acid in the TXY dual phosphorylation loop, mammalian MAPKs are classified as extracellular signal-regulated kinases (ERKs), c-Jun amino-terminal kinases (JNKs), or p38 stress-response MAPKs. The presence of MAPKs in nonmetazoan eukaryotes suggests significant evolutionary conservation of these important signalling pathways. We recently cloned a novel stress-response MAPK gene (tgMAPK1) from Toxoplasma gondii, an obligate intracellular human parasite that can cause life-threatening infections in immunocompromised patients, and we now present data on a second T. gondii MAPK gene (tgMAPK2) that we cloned. We show that tgMAPK1 and tgMAPK2 are members of two distinct and previously unknown protozoan MAPK subfamilies that we have named pzMAPKl/pzMAPK3 and pzMAPK2. Our phylogenetic analysis of a collection of protozoan and metazoan MAPK genes in relation to ERK8-like genes demonstrates that an ERK8-like family, which includes the pzMAPK2 subfamily, is represented across a large variety of eukaryotic kingdoms and is evolutionarily very distant from other MAPK families. Clin Dev Immunol. 2006 Jun-Dec;13(2):167-83. The possible role of transplacentally-acquired antibodies to infectious agents, with molecular mimicry to nervous system sialic acid epitopes, as causes of neuromental disorders: Prevention and vaccine implications. Nahmias AJ, Nahmias SB, Danielsson D.
Pediatric Infectious Diseases, Epidemiology and Immunology Division, Department of Pediatrics and School of Public Health (emeritus), Emory University, Atlanta, GA, 30322, USA. Proof of causality of most neuromental disorders (NMD's) is largely unavailable. Lessons from four-decade investigations of the epidemiology, immunology, pathogenesis, prevention and therapy of perinatal infectious agents, which invade directly the nervous system, have led us to propose a new indirect effect hypothesis: maternal transplacentally-acquired antibodies, to agents with epitope molecular mimicry with the developing nervous system, can cross the fetus/infant's blood-nervous system barriers to cause NMD's, clinically manifest years later.Further rationale is provided by relevant evolutionary/developmental (EVO-DEVO) considerations-applicable also to some vaccines. The hypothesis is being tested in: (a) older pregnancy studies with available maternal and newborn sera, and follow-up of the progeny for NMD's; and (b) NMD registry individuals linked to their stored newborn blood spots. Preliminary results support a possible role for schizophrenia of high-tittered antibodies to some agents (toxoplasma, influenza and herpes simplex type 2 virus).A model that includes likely genetic and postnatal influences is schematized and a list of putative agents and factors, based on varying rationales, is tabulated. In case pilot studies are confirmed, the identified agent(s) and antibodies would need to be tested in new prospectively enrolled pregnant women, so as to establish further risk factors leading to possible preventive modalities. Comparasite: a database for comparative study of transcriptomes of parasites defined by full-length cDNAs. Watanabe J, Wakaguri H, Sasaki M, Suzuki Y, Sugano S.
Department of Parasitology, Institute of Medical Science, Graduate School of Frontier Sciences, University of Tokyo 4-6-1, Shirokanedai, Minatoku, Tokyo 108-8639, Japan. Comparasite is a database for comparative studies of transcriptomes of parasites. In this database, each data is defined by the full-length cDNAs from various apicomplexan parasites. It integrates seven individual databases, Full-Parasites, consisting of numerous full-length cDNA clones that we have produced and sequenced: 12 484 cDNA sequences from Plasmodium falciparum, 11 262 from Plasmodium yoelii, 9633 from Plasmodium vivax, 1518 from Plasmodium berghei, 7400 from Toxoplasma gondii, 5921 from Cryptosporidium parvum and 10 966 from the tapeworm Echinococcus multilocularis. Putatively counterpart gene groups are clustered and comparative analysis of any combination of six apicomplexa species is implemented, such as interspecies comparisons regarding protein motifs (InterPro), predicted subcellular localization signals (PSORT), transmembrane regions (SOSUI) or upstream promoter elements. By specifying keywords and other search conditions, Comparasite retrieves putative counterpart gene groups containing a given feature in common or in a species-specific manner. By enabling multi-faceted comparative analyses of genes of apicomplexa protozoa, monophyletic organisms that have evolved to diversify to parasitize various hosts by adopting complex life cycles, Comparasite should help elucidate the mechanism behind parasitism. Our full-length cDNA databases and Comparasite are accessible from http://fullmal.ims.u-tokyo.ac.jp. Cysteine Protease Inhibitors Block Toxoplasma Microneme Secretion and Cell Invasion. Teo CF, Zhou XW, Boygo M, Carruthers VB. Department of Molecular Microbiology and Immunology, Johns Hopkins Bloomberg School of Public Health, 615 N. Wolfe St., Baltimore MD 21205; Department of Pathology, Stanford University School of Medicine, 300 Pasteur Dr., Stanford, CA 94305. Announcement: the second of four, annual, apicomplexan database workshops. A Toxoplasma section has been added to "The Synaptic Leap," an open source for biomedical research. One of the primary goals will be to facilitate collaboration between labs. I encourgae you to visit the forum, post your research or request for collaboration, and frequently review what others have added. Feedback is welcome!